I am a very lucky person. I have learned I have options—and the biggest option I have in life is not to let the things around me affect what is happening inside me. My mentor taught me that—and the really great thing is I am still teachable at 65 years old. A friend of mine who visits Balboa Island always says, “There are two newsletters—one about the president on the BIIA and one about Carolyn.” I was going to try not to make this be about my story, but I don’t have a lot to write, if not about my own weird and incredible experiences. I have done some really strange things in my life—like the time I took a taxi cab from Kalamazoo, Michigan to Metro Detroit Airport—because I overslept and missed my train—it cost $165.00 in 1964!!! That would be very cheap now. Another weird fact was that I lived next door to a German physicist who invented the process for metal that made possible the oxygen tanks for the men on the moon—and the tiles on the space shuttles. Who knew—my ex-husband apparently! My parents friend’s were pharmaceutical company owners, automobile company owners—but to me they were just people. Which brings me to my story for this month. I learned the difference between a resistor and a transistor and a semiconductor and how to assemble a pc board. I also met the people who bought circuit boards assembling equipment from Western Magnum. entrepreneurs. My new boss just let me run his company until it was bought out by a larger corporation in the early 80s. In the meantime I had a lot of fun learning ho , , , , , ,. ,.Zxcx9w to make transformers and printed circuit boards and car stereos for Sanyo And I learned how to use my BBA to run a business. Dale Cox and I have remained friends. We used to meet every year at Nepcon—the huge and wonderful electronics trade show in Anaheim. Nepcon, like everything electronic, has now moved to Japan, China and Korea. We saw it coming when the Asians with the huge automated machinery started arriving at Nepco. Dale is now in his 90s and has sold Western Magnum. Last year after I called him on his birthday in December I started getting little stories in the mail. Parts of a book he was writing. They made me laugh out loud—at 4 am! The story is about his experiences in World War II as a pilot and is called Top Secret Flight http://www.topsecretflight.com Great Book—I recommend it. coveted positions. His age was against him. Once again, I just knew the person—I just knew we were friends—I had NO IDEA who he “was”. Just that I liked the man, a man who taught me the value of taking vitamins (he still has his pilot’s license), a man who I talked to on the phone every year on his birthday when we stopped meeting at Nepcon, a man who always asked me how many friends I had in my address book and a man who was always willing to meet for lunch in Los Angeles. doesn’t drink, and he didn’t think he was out of town. Lee hung up the telephone and called his daughter who confirmed that indeed his grandson was safely at work in Santa Monica. Theses scammers used to use this ploy on the internet—now they are targeting older Americans who cannot hear very well. Be Very Wary—never send money unless you are SURE you are sending it to the right person. Debt Collection Scam—There are few things more intimidating that a telephone call from a collection agency. Some scam artists have been using that fear to bully people into giving up their debit or credit card numbers on the telephone—then draining their bank accounts or putting charges on their credit cards. The Better Business Bureau said in a recent alert that in some instances the callers have personal information about the target including actual debts, making the call seem legitimate. The bureau recommend that anyone who receives a suspicious call about an outstanding debt demand written proof of the debt and never provide bank or credit card information over the phone until making sure the firm is legitimate. 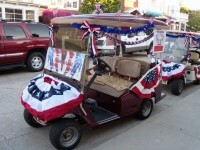 A Huge “Thank You” to Lori Everson for organizing all the neighbors (Friends of Pearl Avenue) for the “Spirit of America” entry in the Balboa Island Parade this year. Our Floats were Courage, Charity and Hope. Neighbors who participated were Jack Owens, Milton Viel, Lynn Franklin, Laverne & Pat Clough, Jim Levine, Celeste and Bob Dennerline and Holly Boyd. 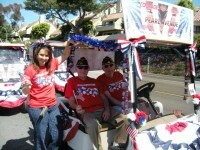 The residents who participated have lived on Pearl for as long as 60 years. 22 Year Residents of Balboa Island. Need two bedroom —we can move any time end of October through end of December, 2011. Older couple—EXTREMELY clean and quiet. One old cat named Magic who loves everyone! Motivated to make your property look great! Each year hundreds of thousands of Americans will have a new or recurrent coronary attack. One dies every minute. The American Heart Association has recommended seven health and behavior factors that can add to the quality of your life. More next month from Shannon—in the meantime contact her at SCC Training http://www.yourwellnesshub.com 949.413.4210 and start exercising on a regular basis with Shannon’s assistance! 2 Bedrooms + Sleeping Loft, 2 Full Baths. Master Suite with Fireplace, 2nd Fireplace in Living Room, High Beamed Ceilings, Skylights, French Doors & Windows, Lots of Brick & Wood Throughout. Totally Refurbished. New Refrigerator, Dishwasher, Microwave. Self-Cleaning Oven. Washer/Dryer Available . Private 1-Car Garage w/Storage. Sunny Brick Patio. Gas Hookup for BBQ. Quiet End of Island. AVAILABLE NOW . . . . $2950.00 NO SMOKING ON PREMISES. Would Consider 1 Small Pet w/Additional Pet Deposit. Ideal for Couple or Single Professional. 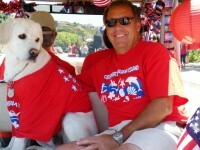 Note: Please Check with Owners as to Current Rental Prices—They Can Vary Seasonally on Balboa Island!!! Still on Balboa Island and there is a huge stock of NCAA, NFL, MLB and NBA Gnomes, Flags, College Doormats, Luggage Tags, Flags, Mugs, Chip Clips, etc. Also Balboa Island Aprons designed by a local resident and License Plate Frames Call Carolyn @ 949.422.8570 and I’ll tell you where! Origins: How the Nine Months Before Birth Shape The Rest of Our Lives . . .
Lisa is always a wealth of information as we talk and she does my manicure and pedicure. This is a good thing since it takes a while! When asked by an anthropologist what the Indians called America before the white man came, an Indian said simply, “ours.” . . Vine Deloria, Jr.